Understanding color can be a daunting task with many dead ends. Have you ever taken a color theory class only to be left feeling like it didn’t teach you anything to do with applying color in the real world? Maybe you have an awesome natural instinct for putting together cohesive palettes or colorizing fabulous patterns perfectly, but why are you so good at it? Validating the why, where and when of color will change your entire outlook on color and what it can do to your personal or professional life. Color opportunities exist in many industries. Companies need color design expertise to guide them through the many choices they have to make as a successful business. Choices they must make involving color range from advertising, product design, branding and many more. You need credible, verifiable information to back up your decisions as a consultant or designer and you need more than a simple love for color to get you there. This is where we introduce “the international color guru”, Leatrice Eiseman - colorexpert.com. 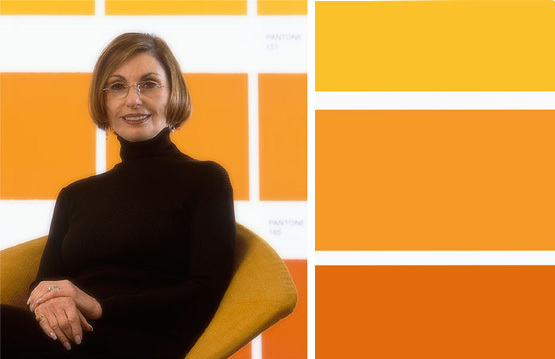 Among many hats, Leatrice is the Executive Director of the Pantone Color Institute, Director of the Eiseman Center for Color Information and Training, has authored eight books to date and will be heading off 2012 with a Color + Design Training Program in Burbank, California. The training program is an intense four-day program for very motivated individuals who wish to enhance their color skillset for application in the real world. Only 20 participants are accepted to the course which allows for a higher quality of learning. 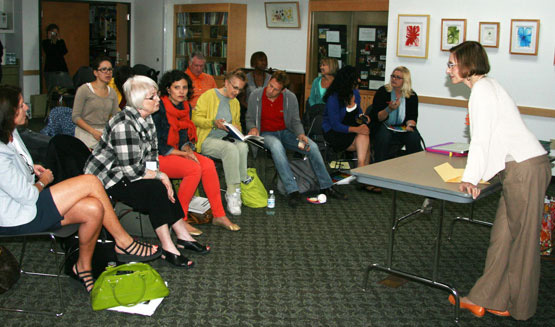 The class covers topics like: Developing your color expertise, The psychology of color, Color facts vs. fiction, The how-toʼs of color forecasting, Future color trends... and much more. 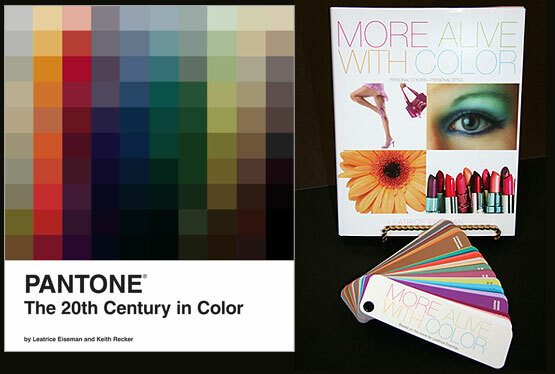 Leatrice’s latest book on color, which is a part of the giveaway, is titled, PANTONE® The 20th Century in Color, co-authored with Keith Recker. Enter the Contest... Share Your Story & Win! Leatrice is giving away one full scholarship, one partial scholarship and some books (mentioned above). In addition to prizes from Leatrice, first and second place winners will share a feature blog post interview on COLOURlovers.com about themselves personally and professionally, expanding on their story submitted. Furthermore, we would like to do a post-interview after the class in January 2012 (posted in February). Contest will run through Saturday, November 25th, 2011 at 8pm PST Wednesday, November 30th, at 12am PST. The COLOURlovers Team will be the judging panel and choose winners from those that put out their best effort. In the comments - post one of your palettes that identifies with you and your story on how color impacts your life as well as how you would like to use color more, to impact the lives of others. Your story can be anywhere between 50-300 words max (click here for a visual of what 300 words looks like). In the case that you may not be able to travel/attend the class, you may still win one of the books! If you can, please mention that you are only applying for a book. We would love to hear your story! This class is January 26th-29th, 2012 in Burbank, California. Travel and accommodation expenses will not be covered by Leatrice. Although an excellent group rate at the hotel is available and the hotel has full kitchens. This is a wonderful contest. Can't wait to read the stories. Color impacts my every day life in huge ways. When I wake up in the morning, seeing the bright colors in my home such as my rainbow-themed dining room start off my day right. Color has a profound effect on my mood in a positive way. Whenever I get sad or upset, I come to colorlovers.com as a way to release bad energy and surround myself with gorgeous colors and color combinations to ease tension, relax, and absorb beauty. Glad you love the little cartoon. ;) Does look like you! 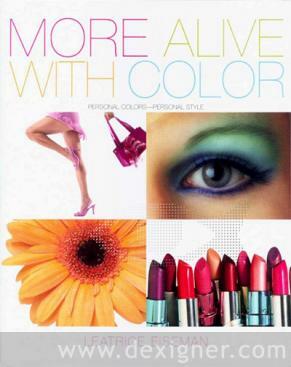 I absolutely fell in love with the colors on the front cover of More Alive With Color!!! Sometimes I wish COLOURlovers allowed more than 5 colors so I could better capture all the awesome colors in this picture! The light pink, the green, the orange, the yellow, etc! So beautiful. I am currently pursuing a graduate degree in interior environments, following my previous studies in anthropology. At the moment, I am working on an oncology clinic redesign, and am beginning to develop color palettes. Color has always been a motivating factor for me, but I am realizing the complications to choosing appropriate color applications. Should the interior be natural? If so, which natural? A natural suggesting relaxation--tropical, spa-like colors? A natural suggesting the regional environment? The warmer colors of the West, since greens and blue fill light can cancel out any pinkish, healthy appearance of staff and patients alike? Would patients even enjoy a natural color scheme, as it's a definite healthcare cliche? Would they prefer a palette that suggests an enjoyable activity, such as a dining destination, etc.? I am also interested in synesthesia and in memory. Can a color suggest a memory? If so, does it need to be a large swath of color which nearly encompasses the viewer's plane of perception? Can a "flat" color do this, or would a color over a textured application be more likely to do so? Eventually, I would love to have the opportunity to travel with the intention of comparing architectural color application on a global scale. However, if not, I plan to pursue professional interior design further, focusing on aspects of interior spatial form (as opposed to surfaces and finishes), color (differences in application if added prior to manufacture, applied as a finish, etc. ), and color psychology. For me colourlovers has been, besides fascinating, an amazing journey of learning. Playing with palettes for the past year and a half, has helped me consciously define my own preferences in a palette. I gravitate towards blues in the violet half of the range, red violets, blue and green aqua’s and this year for some reason, burnt oranges. I see “signature palettes” from others now as well. People have very specific preferences. Just as people have verbal expressions they use frequently and comfortably, they have specific palettes they resonate to as well. I see it here among my fellow CL’ers on Colourlovers, and I see this same “palette signature” clearly in artists and designers. The designer Karl Lagerfield, for example, chooses black and white with occasional pops of pink, as opposed to Oscar de la Renta with his masterful (perhaps the most masterful), and painterly ventures into cadmium yellow, emerald green, saturated magentas, deepest aqua’s and turquoise. Valentino has his signature orange red. The painter Marc Chagall had an affinity for blue violet. Picasso loved olives and khaki’s. Whereas, John Singer Sergeant loved white and tints of white in lightest aqua, soft lavender, and light pink. In an on again, off-again fashion, I have been an artist most of my life. Twenty years ago, feeling the need to understand color better, I started studying painters and their palettes, beginning with the colors of Monet. Since then, in all facets of my life, I have been making more informed decisions about color; in my wardrobe, my living areas, and in my own art. I would love to have one of Leatrice's new books! My love of color comes from within. Actually, to be more specific, it comes from my physical body. My family happens to be made up of very colorful people. All three of my siblings as well as my mother are blondes, ranging from pale yellow blonde to rich golden wheat, and they all have some shade of blue eyes ranging from misty sea blue to bright royal blue. My father is dark haired and dark skinned, but possesses remarkable piercing blue-gray eyes. Inspired by my own family, I grew up fascinated by the variations of human coloring, especially eyes. My own eyes are a rather unusual golden green, and I took solace in their beauty despite my unremarkable mousy gray-brown hair and pale skin. I felt plain compared to my striking, contrasting father and my glorious golden-haired mother and siblings. Over time, though, I came to find pleasure in the subdued and muted canvas my skin and hair provided for my eyes, my crowning jewel. Now, I am most intrigued by palettes in nature that are a little muted-- the ones that are maybe considered boring or ugly by some-- but that have their own quiet, dignified loveliness or serve to set off more vivid tones. For example, the taupe-brown of tree bark combined with the regal chartreuse and scalding orange-red of a tree in Autumn. Or how about the muted terracotta and soft white of a bluebird's belly that set off its cornflower blue? I want to use color to show people how beautiful their own natural contrasts and harmonies really are. Color inspires me, it boosts my mood and makes me happy. Color is the one constant in my life and it defines my world. I would be grateful to receive a book. Thanks for the opportunity! Born and raised in rural Miami-Dade county - yes there’s a rural element within 20 miles of South Beach – you might think the color palette best fitting me would be a bright sun-splashed one. But the inspiration I’ve found is from the native Seminole tribes who for generations have sewn tiny scraps of assorted fabrics into patchworked squares or stripes to embellish their garments. The saturated colors this tribe uses in shirts, blouses and skirts don’t get lost when the extremely bright Florida sun bleaches out the landscape rendering most colors and the people wearing them into waves of heat. Only colors with depth remain, underscoring the ability of both the Seminole and me to weather this climate. My life’s work is marketing, advertising, promoting tropical fruits and vegetables. Again you would think my work’s color palette would be bright sun-kissed colors. With most tropical produce companies taking this expected color route, they unwittingly work within a modicum of safety that overshadows their marketing messages, in effect coloring them ineffective. By embracing the color palettes of tropical natives in my marketing, it gives a depth, a weight to the message, saying papayas deserve more space in your produce aisle, SlimCado avocados should be considered an alternative to the hass, and why not try selling starfruit, produce can be fun and profitable. I value understanding color. I’ve bought expensive books and waded through them trying to gain this knowledge. The impact of a class would be enormous given how much I was able to use from a ‘Color Me Beautiful’ cosmetic sales class over a decade ago. Sounds trite, but what I learned I use on a daily basis. To talk about color as simply that, the potential is exciting. Palette also available for the 1940's Seminole doll " />. What color means to me is an expression of oneself of their mood and personality. I find the best way to express colors is through wearing clothing that is expressive, such as a bright yellow polo shirt that no one has or a mix of colors that makes a the shirt or jacket stand out. I feel that if you really put in an effort to look good and match colors, it will show. Everyone expresses themselves in some fashion. Some people write poetry. I can't spell. Some people play musical instruments. I can't hold a tune. Some people dance. I can't even walk in a straight line. But what I can do, and how I express my passion, is through the respect and endless exciting possibilities of color. To me color is basically the fifth and half sense. Not the sixth sense - nothing creepy, but at the same time so primitive that it can relay messages almost instantaneously and more clearly than almost any other method of communication. And although color is not required in order to see, it is the final layer of connection that can evoke powerful emotions. If you understand color and how to harmonize it into a meaningful message, than it is just as influential as any song, book, or performance. As in "The Giver," by Lois Lowry of a boy who discovers color and music for the first time in a black and white world, I also ask myself, "Are you really experiencing something if you aren't seeing it in color?". For me, the answer would be no. Color holds the ability to project moods, identify, record history, and brand people and things. Exploring and learning this art is taken for granted, but certainly worth the effort. This particular palette expresses my individuality because I strongly believe in growing from a solid foundation (thus the yellow, red, & blue), but also you have to have fun with anything you're passionate about and stay energetic (and even breaking the "rules" sometimes). This palette is fun and simple, just the way I like life. P.S. I'm applying for the full scholarship or a book, thanks. I have owned a graphic design business for more than 8 years. While exciting, fun and challenging in the early years, I have felt for some time that there was something more out there for me, a career that would really pull at my heart and allow me to truly contribute something that would affect people in a positive way. I received an email about the Color Conference held in New York this year and when I read about the speaker, Leatrice Eiseman, I looked at her website to learn more about who she is and what she does. Although I was unable to attend that conference, learning more about Color Consulting as a career sparked something in me - that was what I wanted to do! Upon further research into the various industries in which a color expert could work, I got even more excited! I love considering new color combinations in my own personal and work life - wardrobe, furniture, art, colors for client logos and websites, etc. and the possibility of being able to be more intimately involved with color as an expert consultant has awakened an exictement and joy in me that I've been looking for. I can visualize myself providing color consulting services to places like pediatric hospitals, retirement communities and psychologists offices where the well-being of the people staying, living or visiting those places can be positively affected by the color on the walls, the artwork and furnishings surrounding them. I love the idea of helping women who have had challenges in their lives and who have low self esteem, help them choose colors for their wardrobe that help them feel beautiful, confident and strong. The color palette I created is both representative of what I do now - periwinkle blue & dark gray are my graphic design business brand colors - and where I want to transition to (dark brown, orange and light peach). The last three colors represent a warmth, excitement and sense of joy that I feel knowing I am about to embark on this new journey. When I was younger, Dad would always buy 2 of the same item, one pink and the other would be yellow. Somehow I would end up getting the yellow ones every time, while my older sister of four years difference got the pink ones. We had quite an interesting childhood, with lots of fun and bullying too. I grew up loving yellow, but not so much of pink because pink was equivalent to her and that I was rather afraid of her then. I relied on the happy and reassuring colour, my all time favourite yellow, for comfort. Yellow also gave me confidence through school. As a young adult I love and appreciate pink now, even when it is in its darkest hue. The combination of yellow and pink will never fail to remind me of sisterhood. Colour therapy is not widely accepted in my country, but I believe that it can affect one's mood and thus behaviour to a great extent. To research more into colours to help others is one of my life's goals. As long as I can remember, I have been passionate about color. I dreamed of being a painter, a crafter, an interior designer, etc. The problem was that I had the unfortunate belief that artists were born with innate skill. It never occurred to me that someone could learn how to create works of art. So, I did not take art classes, design courses and I never described myself as an artist. I became a parent educator, I worked with families under stress bringing them plans of action and making referrals. But wouldn't you know, I always found a way to work with color, I made jewelry,stenciled furniture and made cards with rubber stamps and beautiful paper. I became a personal color consultant and zealously decorated my environments. Still, I couldn't describe myself as an artist. Three years ago, I was blessed with a baby boy and left my career as a social worker to fully tend to him. Becoming a parent literally transformed my life. I began to really listen to who I was and my fervent desire to know how to be an artist led me to take art and graphic design courses at a local college. There I discovered that one can be born with skill but that most artists work very hard at learning technique. It takes lots of hard work and practice to be an artist. I can be an artist!! I can be a bit reserved at times, and I found myself weeping with gratitude over my art classes. I know being in the creative field is what I must do, I want to bring color to other people. This artist dearly wants to learn more about color. I feel like I have been waiting for this 4 day seminar my whole life. Great job everyone. Keep 'em coming. Color is more than an escape. It's more than a getaway from any kind of reality, a vacation from the world around you or any thing just to take me away. No, in my world where muted colors cavort, ugly off-whites and salt-and-pepper tiling reign, and anything but the coldly corporate flat blues and grays is a faux pas of epic porportions, color is an expression of shades of hope. Somewhere out there is a future, a future that holds suns rising in gold, gossamer and crimson, prime, lime ideas and bright blue dreams. Color flies in my chest the way the sky rises to greet the morning and blanket softly over the velvety night. Color enters my eyes, feeds my mind and ebbs and flows from my fingertips with every number in a hexidecimal chain. Color dances, color sings, color is a couplet that makes the Lauralites gasp in awe. Greens spring from the darkness, blues sigh out the skies, reds cheer and blush, oranges smile and twirl, and yellows rise out of a weedy, overpopulated deep and stretch out to follow the eyes of the sun. Color is life and beauty and futures and pasts. Color is what makes us human and makes us one with the earth. Color can't be nothing. It just can't. So it became everything. As a figurative sculptor, color choices can make or break a piece. Sometimes keeping a form bisque white seems like the easiest way to go - but I'm a color lover and I have to layer it on. My current passion is restoring an 1888 Carpenter Gothic Farmhouse is rural Northern California - the oldest standing house in our tiny community. It's a labour of love and after 7 years of hands-on construction (the house hasn't been lived in since 1972 and we're doing all the work ourselves)- I've been dying to get to the point where we choose colors. Now we're there, and I've thought about it so much over these last years that I've really made it complicated. I'd love some new ways to think about finding color schemes that will really work for this special place. Cheers for a Colorful Holiday Season for Everybody! Black is perfection, darkness, sorrow. Red is passion, energy, power, courage, purity, joy and celebration. Black is the color of my hair, red the color of heart. Black is the deep reflective me, moody and mysterious. Red is the passion and love I have. I am black mixed with red. I am dark but I am full of joy. Color is what I see and color is what I feel. I see green, I feel calm. I see blue, I feel melancholy. Most days I wear black only, with maybe a hint of red. When I chose a different color whose around me respond. They see and feel the energy and emotion and they respond. My life started of fruitful; it had all the ingredients to make a good life. It was bright, rosy and untainted. It was a pale, delicate, pink of innocence. Everything was new and exciting- color was new to me yet I didn’t consciously know of its meaning. Sadly several things have happened that made my younger days a misery, scared, lonely. I felt no one or nothing could help me and I felt I had lost the ability to enjoy my art. Everything became daunting and overwhelming. The colors all became a jumbled blur left me feeling very ‘wishy washy.’ The colors merged together making an uncomfortable color, ( that greeny brown that you get when you mix all the colors together) and before I knew it I was stuck in a thick haze of grey and confusion. Numb and detached. In fact I felt totally separated from reality. I felt beyond help and stuck in a deep, dark hole of hopelessness. I could only tiptoe vague amounts of color around the edges of my grey cloud and they would clash and argue with one another until they gradually faded to white; blank. In the last five years, color has been creeping back into my life; it started of in gentle hues and then erupted into explosive color just recently with the help of my doctor, psychologist, friends, family and lovely boyfriend. After learning some hard, painful truths- I started to feel real again. I now have a much more positive outlook on life and feel that all the negative stuff that happened has made me a better person and opened my eyes to how colorful life can be. I want to help and inspire others. I want to teach others about art and help them see that they can achieve anything they desire if they just keep going and not give up. I feel that my life is very yellow now, creative, buzzing and glowing with warm orange energy. Everything is now rather an opportunity, a challenge, a chance to make, create something. Not a dead numb block. There are still blue moments and a variety of other emotions but all of my colors now dance together in harmony to make several different exciting palettes. And my innovation has accelerated through the roof. I am so very looking forward to the future and inspiring and helping others. This palette is derived from a picture of President Obama that I shot during the 2008 presidential election. Like many people, powerful, bold colors, appeal to me, & this palette is an illustration of how important color is to branding & almost in a deeper way, identity. As a photographer & artist, color is a foundation, on which I build & explore my world & communicate ideas & feelings. Color impacts my life profoundly. It's funny to think about how much really... but I spend no less than 4-5 hours everyday playing with color adjustments and intensities in Lightroom and Photoshop. When I am shooting... 2-3 hours selecting elements & backgrounds with complementary tones. Advanced color training & materials especially relating to the Pantone collection would be very appreciated especially for a series of socially conscious posters I am planning to create in 2012. Thank you for taking time to read my reply :) You can see my work on my site, if you wish, at www.devignelements.com. Cheers! Color makes me happy. I cannot imagine a world without color. It inspires me in everything I do—in my home and in my career. As a graphic designer, I know the importance of color in design. When used correctly, it can transform the most challenging project into a successful marketing tool. The right colors can make a package sing, right off the shelf and a company’s branding stand out from its competitors. It’s always my goal to make every one of my design projects sing! I have to admit that I tend to obsess over colors when I’m working on a new project. The colors have to be perfect and I will go through all the pantone swatches until I find the right palette for my clients! My obsession with color began at a very young age. Being of Ukrainian and Polish descent, I was surrounded by bright hues all my life—from the folk art from my parent’s homeland to the pysanky that we painted every Easter—color was always there, comforting me like a warm, colorful quilt. Growing up, I always knew I wanted to do something with color in my life. But as we all know, life is made up of many unexpected detours. It wasn’t until I quit my job at an agency five years ago and opened my own design studio, Marigold, that I was able to focus more on color. I joined the Color Marketing Group to meet color experts and to learn more about color forecasting. I was a bit overwhelmed the first time I attended a conference but I quickly overcame my fears because the people I met were just like me—passionate about color. Unfortunately, I couldn’t renew my membership this past year due to the downturn of the economy. But I was fortunate enough to attend the Color Burst conference this past September as a non-member. Since color is an important part of my life and career, I hope to renew my membership soon. I still have so much to learn about color. My goal is to become a true color expect, learning from the best in the industry, like Leatrice Eiseman, so I can provide my clients with color advice and amazing color palettes for their projects. I feel it’s important to learn as much as you can about something which you are truly passionate about. As Steve Jobs said, “Your work is going to fill a large part of your life, and the only way to be truly satisfied is to do what you believe is great work. And the only way to do great work is to love what you do.” I truly love what I do. Now I just have to learn more about it to help other enrich their lives with color! I'm really pleased to submit myself for consideration for Leatrice Eisemann's workshop this coming January. I've worked with Paul Haft for four years now. Having begun as a writer here, I've become Haft2's Director of Brand Colour Intelligence. This year, I became a member of Color Marketing Group, which is something I've aspired to for ten years. and to cool days on the grass in New England. Our own company, Haft2 has emerged as The Colour Authority for Branding. Our mandate is largely a not-for-profit one, developing colour and brand strategies for healthcare and cancer research foundations, and humanitarian development agencies. Our client list is special; it's high-profile and yet we opt to retain its more contained size in order to give everyone the attention they deserve. We insist on keeping our human touch to everything we do. It feels a bit old-fashioned for all of the good reasons; it's the same reason I look to the past for much of my colour inspiration here on COLOURlovers. I would love the chance to attend Leatrice Eisemann's class because she's a titan in our world and I want to meet her. I'm happy to answer any questions you may have about me, or our company. “I love your pattern!”, ”Thanks for loving…” I guess these simple words made me to go deeper and deeper into the waters of colors. I am not a graphic designer and I don’t know what the colors are. I don’t know how to draw. I have no idea how colors effect people. I am not in any kind of business that use colors. I don’t actually know why I am here … yet. What I know that I always liked colors, I loved to play with them but I never did anything about it until I googled the colourlovers. Thank you! "Thank You" to all creative people from colourlovers that helped me to understand the other side of myself. I’m sure I would never discover it without you! Less than two years ago, death snatched a dear person to my heart. A man I loved and wanted. It was slow, long and ambiguous I exhausted all my stocks of hope and optimism in the process. A whole path of possibilities and future vanished before my eyes. Every plan I had for my life went wrong and I was left with nothing but a large void in my heart. On my long Journey of healing I met an old friend of mine, that friend's name is Color. It reminded me how much I used to love colors, and how much I was born with it. I remember once I was about eight years old making a fuss and screaming at my dad to replace a gift lunchbox with another one just because it's orange and not RED like I wanted!!! I could care less that the red lunchbox was missing some stickers that were in the orange one. I made those same shapes myself, colored them and stuck them with a clear adhesive on the box. I was happy with it! COLOURlovers was my means this past year to rekindle my relationship with that old friend. I started with inexpressible ideas, to being colorfully obsessed with some others, to recently a winning palette in a contest ( I never win anything before!! :D) Color by color, palette by palette; color loving helped me patch that void. Opining my eyes to the beauty around me, appreciating the little things and accepting whatever is. As much as color added to my life I want to give the chance to others. If I ever had the chance I would either design cloths or make movies. An ordinary person would think of the world as a bleak dull place to live in with all the frustrating news we hear all the time. But an artist would think of it as an open canvas with infinite possibilities. I'm an artist, and I love colors! I am a true colour lover. Not only a @ColourLovers follower, but a true lover of colours. I do not have any formal training in colours. All I bring is passion. My personal favourite pallete may not be as defined as others, but it is anything that brings happiness and light into my life at that moment in time. What does this mean? On days when the sun is shining and the birds are chirping, I enjoy being in a room with soft white walls and accents of tangerine orange and fuschia pink, thrown in with a hit of green. On days when the heaven is weeping and the clouds mask the sky, I enjoy warm taupe walls with deep purple and deep chocolate accents along with peppered hints of a mellow gold. I love colours. I want to learn as much as I can about the impact of colour on happiness and personal well being. I have a unique passion for colour in that if it is void from my life, I become emotionless. At work, I have every imaginable coloured sticky, flag and marker (you never know when you want to work with a peach colour one day!) At home, my house consists of a pallete of 18 wall colours (and they work together seamlessly). I love colours. I truly have a passion for colours. I would like to take this opportunity to learn from the best and bring back a newly informed view of the infinite possiblitiles of colour palletes. People are scared of colour. I want to bring informed enlightenment to these individuals showing them how colour can be divine, spiritiual and healing. Life without colour? Life is colour, colour is life. I would like to apply just for a book as I live in Australia. During last 2 years my life turned upside down..few times around. I have always loved drawing and painting..but never thought I have any special talent. During my course I have discovered what I did not see before. Special sense for colors. Being able to see little differences between colors..finding the right tone..come up with the perfect combination. It was like discovering a new side of myself..it all made sense all of the sudden and gave me what I was searching for a long time. My profile pic is one of my latest work. Hope you will enjoy it! Colours are a true miracle and a great weapon!! I remember myself at the age of 4 staring at pieces of fabrics for hours just because of the patterns and the colour combinations, feeling butterflies in my tummy... That same feeling has never left me! Colours are my great inspiration! My passion is to help others project their personality through the colours and clothes they wear, and through the colours in the houses they live! This scholarship is a great opportunity to deepen my knowledge! I’ve started typing this with an urge to prove that I know Color. Like I can tell you something that you haven’t already known from physics, psychology or theory of fine arts. But the more I tried to formalize and frame my relationships with color, the farther it got me from the truth. I do not know Color. Can I use it – yes, I use it perfectly – just as I feel it. Despite an art-school, where the main goal was to make my drawn apple look like an actual one. It took me years, and it’s tons of apples, to find out: I hardly see the world in shape and volume, but I percept it in series of colored spots instead. I realized this and suddenly everything fell into places – art became art, it got better and bolder, I wasn’t trying to fix it… since I only wanted to share the way I see the world. I am still learning, working to get a second degree – and to become a professional illustrator. And Color – is my main tool. I hope it will always be. I wish I knew more. I wish I knew if people see same colors in different way. You can study your whole life and yet have unsolved mysteries left. One thing I know for sure: same colors often bring different emotions. But to communicate using colors, “in Color” like “in English”, to create, to describe the mood and the moment – is such a pleasure! And it’s not only about art and design. Colors are everywhere; even the black hole is Black. Color is not limited in time or space, unfortunately we are. As I live far, I can only apply for a book. Even though it might sound pretty obvious, it isn't. Because one thing that we all do is draw what we WANT to see. To truly seek out the power of color, you have to experience it. Live in it. LOVE it. Nothing is ever one color. NOTHING. Mastering color might sound easy, but trust me... it's not. To master it, you have to USE it. FEEL it. Color is something that can never be destroyed, nor created. We just have to find it. Colors are also in festivals, and animals, and those things inspire us with color because it is probably something you might see everyday. P.S. I am just entering for the book... thank you.